The moment I walked into Clarkston High School, my department head had me pegged. I don’t blame her. I am a 5’7″ blonde with blue eyes that have a tendency to release more tears than most. I have a permanent grin plastered on my face (especially when I am at work). Phee, in So Not Okay would suggest I “sorta brought it on myself.” Why wouldn’t she assume that I am wholly incompetent and incapable of doing the job I was hired to do? In “So Not Okay,” Tori, Phee, and Winnie are three best friends trying to survive one of the harshest battle grounds known to every American: middle school. When the three of them become the target of insults from Kylie and “The Pack,” they become increasingly self-conscious about everything. That is until Ginger shows up. Ginger is the new girl in the sixth grade. The Pack immediately assumes they have her pegged: loud voice, red hair, over-sized clothing. They assume she is useless to them, and thus, useless to everyone else. The Pack shift their attention to ruining Ginger’s sixth grade experience. I have never encountered more professional hostility than the day I got a phone call from her. She wanted to discuss my lesson plans. Sure! I thought naively. I bet she wants to talk about how much of a rockstar I am with planning my own curriculum. I’d never gotten a phone call after school hours about lesson plans. My previous department heads gave me a metaphorical gold star for completing my lesson plans every week. “I noticed you have daily grammar practice as your sponge each day.” She cleared her throat. I wasn’t sure why. “Yes.” I replied, furrowing my brow at the other end of the phone. She was growing increasingly angry at me. I wasn’t sure why my teaching grammar had incensed her so much. The opposition didn’t stop there. She began to send out department-wide e-mails with my lesson plans–ripped to shreds–attached and copied to everyone in the department. She would schedule walk-throughs just to make sure that everything was on my bulletin boards. God help me if it wasn’t. She talked about my pedagogy to my colleagues and made fun of the work I was doing, with her door open for others to hear. I felt alone and vulnerable. It was the first time I had felt this way in a professional environment. I didn’t tell anyone. In fact, I was careful not to defame her professionally. I simply assumed that was how things worked at my new high school. The Pack was even more ruthless with Ginger. The girls block her from going to class; they call her “Gingerbread,” and make fun of anyone who talks to her. They make fun of her loud voice and exclude her from everything: even group science projects. Tori, Ophelia, Mitch, and Winnie watch it happening, but do nothing about it, but eventually, the harassment becomes too much for Tori to witness without taking action to protect Ginger. It didn’t feel good for Tori to be the target, and she couldn’t stand to watch Ginger to be the scapegoat of all of Kylie’s misguided aggression. 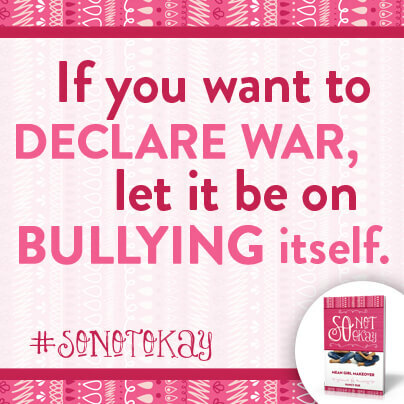 The group turns into a “tribelet” and declares a war on bullying. In my experience, it didn’t take very long for a few of the most respected professionals to notice what my department head was doing. At first, it was a co-teacher (who remains one of my dearest friends to this day) who pulled me aside and assured me that I was “an excellent teacher,” and that what she was doing was so not okay. Then, it was another department member, whose daily affirmations never failed to keep me in line with my end goal. Then, another Department Head who coached me through how to handle myself with dignity and respect. Then, an academic coach witnessed her ruthless and supremely unprofessional behavior in action. She e-mailed me later; it had been going on for so long I hardly even noticed it. Finally, an assistant principal walked alongside me and affirmed my professional decisions and fought for my integrity. My experience pales in comparison to what I’ve seen my students go through. In fact, in the middle of my professional maelstrom, I had to address my students who were bullying a single student in my fourth period. Revitalized with new fervor against bullying, I re-routed my lesson covering Romeo and Juliet and instead focused on what bullying can do to someone. I would not stand for this behavior to go on in my own classroom; not when I knew how much the careless words and actions of others could sting. You see, bullies think that they can break whomever they please. They believe they have someone “pegged” the moment they see them. They make rash judgements about someone’s character before they give their victims a chance. My assailant thought she could break me; but she didn’t. Because of my “tribelet,” my students had the highest EOCT scores that semester than in recent history; even higher than when she taught ninth grade literature. Her professional bullying would prove to be a bigger motivator for me to continue to trust in the work that I was doing and purge the words that hurt the most. I can legitimately look back on my only experience being bullied and smile. She did not make me stronger, but the support from my other co-workers did. My insistence upon ignoring the negativity made me into someone that I could respect. Eventually, she began to respect me as well. Somehow, I had proven myself. I wasn’t just a tall, dumb blonde with a propensity for tears; I was a professional who would fight for her right to teach. 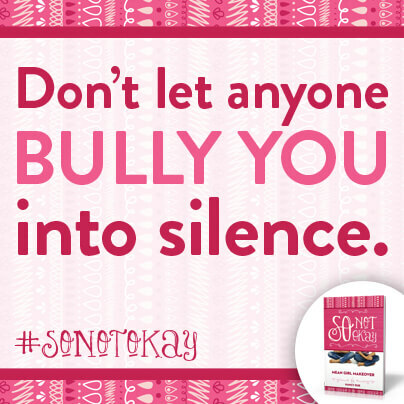 So Not Okay by Nancy Rue takes a stand against bullying, and attempts to show teens and tweens that even their inaction can lead to bullying. 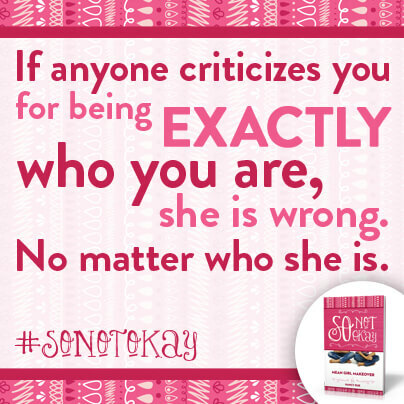 She gives students a way to cope with the negativity and establishes a “Code of Respecting the Dignity for Every Human Being.” Nancy Rue writes accessibly for all teens and tweens to be able to relate to the deep friendships of Tori, Phee, and Winnie, yet explores how delicate these relationships can be against adversity. The one element to her writing that I loved the most was the fact that the reader is given total access to Tori’s innermost thoughts. The reader discovers that she, too, has the thoughts of a bully, but decides against the temptation to combat bullying with more bullying. I love that Rue shows that we are all broken. It just takes prayer, action, and accountability to make the right choices; especially throughout our teenage and tween-age years. I would recommend this book to all teachers, mommies, and students who want a “game plan,” for what to do when witnessing or facing a bully. Luckily for you, I have a copy that you can win, simply by entering the giveaway below. 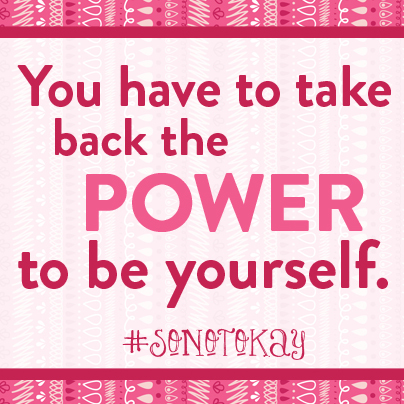 Bullying is #SoNotOkay; join the movement that is sweeping the nation. Have your students sign the pledge I’ve attached in order to establish general guidelines for respect in your own classroom. Hang the attached poster in your room; just don’t pretend that bullying doesn’t exist. I’ve had my share of feeling bullied and tried to walk through it with dignity and not forget what I truly stand for. I’m actually in the middle of dealing with “mean girls” with my daughter and it’s a struggle not to take charge of the situation for her. Instead, I am walking next to her with encouragement and discernment to see what really matters and never forget that she is always supported. We have chosen to pray for those that choose such a route and see how one girl’s insecurities can spread like wildfire to the rest of their pack! Such an important topic- so personal and sensitive for so many people. Thanks for sharing your experience! My daughter and I are walking through this now as a junior high girl. She is homeschooled but faces this at church, especially with the boys because she does not choose to dress like other girls. We have been trying to address this carefully and pray often. Thank you for sharing your experiences. I remember bullying in early years of elementary school, back then though it seemed like the teachers were more on top of it! I’m a teacher, too, and can relate. In my case, it was parents of my students who tried to bully me. It really doesn’t make sense since we’re on the same team! I was overweight as a child and I remember being bullied by one girl in particular. She was just plan cruel. I honestly just held it together and then went home and cried. My experiences have made me super sensitive to the subject. My kids know that bullying of any kids will not be tolerated and that they should stand up for others that are being bullied. My oldest son did just that a while back and it made me so proud! Thank you, Nancy. Your work will inspire many to become strong in Christ and community. Congratulations to Sona for winning the giveaway!